In 1985, the US Chess Federation announced a new tournament. It was called the “U.S. Tournament of High School Champions.” It was a novel concept: each state sends its High School champion to compete for the national title. It is a tournament where all the participants are already winners. I was a high school senior at the time. Living in Colorado (and before that, in Wyoming), I was known mostly in the Rocky Mountain West. In late 1984, I started studying with Grandmaster Dmitry Gurevich – my first coach after I came to the United States from Russia in 1979, and my chess improved quickly. By the summer of 1985, I was the best player in the region, but I was looking for some national recognition. The Tournament of High School Champions seemed like a perfect way to achieve it! The first step was to qualify. There was one other competitive high school player in Colorado: an expert named Steve Towbin. Although I outrated him by about 300 points, I knew that in a Swiss system state junior championship tournament, with a fast time control, anything could happen. Following the tradition of Botvinnik, I lobbied to change the qualification rules so as to increase my chances! 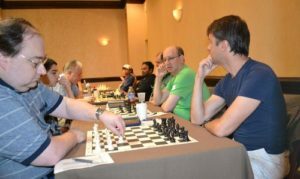 I had a seat on the board of the Colorado State Chess Association and this gave me additional power. I wanted to virtually guarantee that I got in! It seemed that chance should not decide who goes to this very important event, and I was able to make that case. I suggested a match between the top two players in the state (with a slow time control) to decide who qualifies, and I won the match against Steve, 4-0 (the state championship tournament had ended with us sharing first). After qualifying, I was able to raise funds for my trip by giving simuls around the state. I remember that at the end of one of those simuls, one of the participants told me “When you go to that tournament, win it, and show them who is the boss!” I don’t think I had the confidence yet that I could do that – but by the time the event started I felt that I had a chance. When the tournament started, it was called the “U.S. Tournament of High School Champions”, but by the end of the tournament it had been renamed the “Arnold Denker Tournament of High School Champions”, and now people just call it the “Denker”. It was the start of a great tradition – and a great tribute to Grandmaster Denker, who always saw youth chess in America as a top priority. Looking at the crosstable now – I was the highest-rated participant at 2409. But I did not at all think I was the favorite. Before one of my games, my coach Dmitry Gurevich told me: “Don’t be afraid of your opponent because you are stronger than he is.” I am not sure I quite believed it. Winning 5 games in a row after a first-round draw, I won clear first in the inaugural Denker tournament. I feel honored to be part of the history of this event. Footnote: Alexander went on to become a GM in 1992. The game that appears above was played in the last round and gave him the title of 1985 GM Arnold Denker Champion of Champions.